The Islanders celebrate another Terry Evans Cup crown and was joined by Evans’ son Ronald, 7th right, 2nd row, after he presented the coveted prize. When they needed him most, defending champions Islanders goal keeper Monty Butler came through, in helping them to retain the BVI Football Association Terry Evans Cup knock out crown they won in 2014, on Sunday night. There was no 2015 competition because of work being done at the A. O. Shirley Grounds. Butler, most importantly, made a key blocked shot, diving to his right during in a thrilling penalty kicks shootout, to fended off the Virgin Gorda Sugar Boys, 8-7, for a successful title defense. Both teams played through a defensive tussle with neither squad being able to capitalize on their limited chances as they settled for 0-0 half time tie. In the 63rd minute, Kevin Fisher blasted a right legger through traffic and past the goalie to gave the Islanders a 1-0 edge. Five minute later, the Sugar Boys’ Michael Castello equalized, then they lost another opportunity on goal, after being off side and settled for a 1-1 draw at the end of regulation, setting up the penalty shootout. 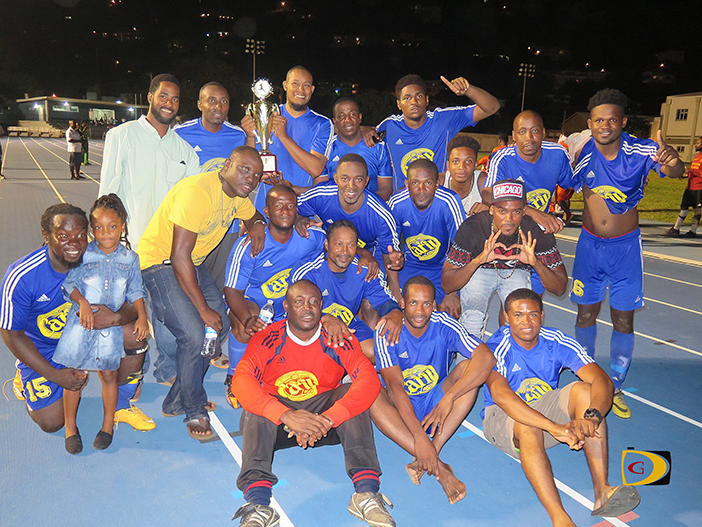 Sugar Boys captain Derol Redhead said it was a good game for the entire 90 minutes. “We expected a good run from them and it al came down to the penalties and that’s where we lost it,” he pointed out. Next up is the Wendol Williams Cup—a knock out series in honor of the former BVIFA Executive Committee member—who died of a heart attach en route to the 2010 FIFA World Cup in South Africa. The competition opens on May 22. To win that title, Davis said they’ll have to practice more as they haven’t had a chance to play together since 2014. Redhead said they’ll evaluate their Islanders match before setting to defend the Williams Cup. “We will see where we made our mistakes, try and work on those areas and hopefully, we can come and defend the Wendol Williams Cup,” he explained.